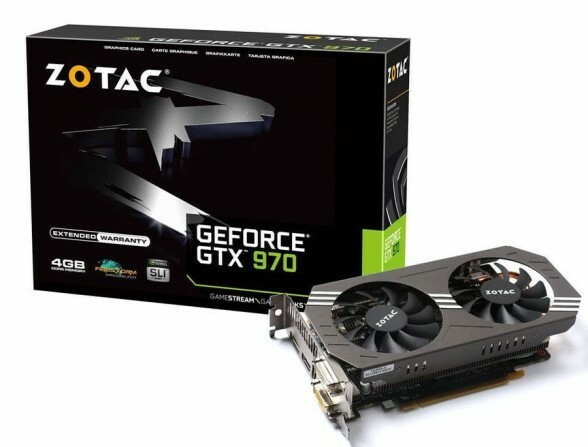 A Phillipine computer store has leaked an official image of Zotac’s GTX 970 as a “sneak preview”, which is well ahead of the rumored unveil date of September 19. As depicted on the box, the Zotac version of the GeForce GTX970 sports a whopping 4GB of memory and carries Zotac’s custom cooling solution. The cooling shroud seems to be crafted using aluminium and take up 3 expansion slots. Whether or not this card comes factory overclocked is unclear but it wouldn’t be surprising consider its beastly-looking heatsink. Other rumored specs of the GeForce GTX 970 include 1,664 CUDA cores, 138 TMUs, 32 ROPs, and a 256bit wide memory bus. The card is also rumored to be priced at around $399.99 upon release, similar to the GeForce GTX 670’s price when it launched.